#9: PIPA coral forestsIf you've never read The Lorax (Dr. Seuss), you're missing out. It's a brilliant book about Truffula Tree Forests, which support a high diversity of magical, mystical creatures like Bar-ba-loots and Swomee Swans and Humming Fish. In this story, the forest gets slowly cut down by the Once-ler in order to knit thneeds (that everyone needs!). As the Once-ler systematically destroys the forest, the fantastical inhabitants suffer. They face food shortages and disease and suffer from smoke pollution (from the Thneed factory, of course). The Lorax is one of the strange forest dwellers, and the self-proclaimed spokesperson for the trees. The Lorax tries to warn the Once-ler that at the rate the forest is being destroyed, it will no longer support the thriving thneed business (let alone the diverse and complex forest community). "I am the Lorax, I speak for the trees, which you seem to be chopping as fast as you please...". Enough rambling. What does The Lorax have to do with corals? More than you think! Trees create the forest, and the same goes for corals. No trees, no forest, no fantastical forest creatures; no corals, no reefs, no spectacular reef creatures. And by the way, The Laroc is just "Coral" backwards. :-) Check out the photo above this paragraph, and below (top) of the coral with fish hiding among the branches and curls. 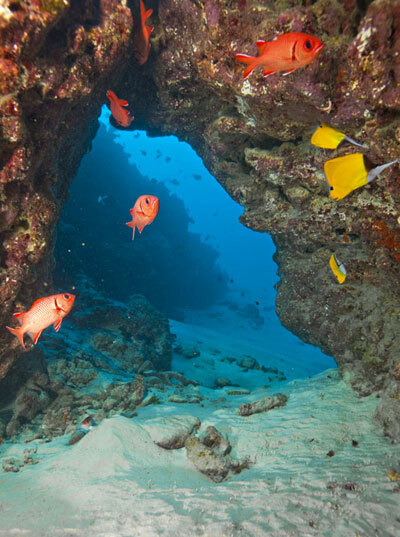 From the fish's perspective, the coral is certainly a forest! Similarly, look at the beautiful archway in the photo below (bottom). Though the arch is topped with a few live corals on the top, the arch is mostly composed of dead coral skeletons that are *still* providing reef structure - yup, it was all built by corals. Corals grow very slowly. Take the brownish Halomitra coral with purple edges. The edges are the growing tips, not yet populated with symbionts. 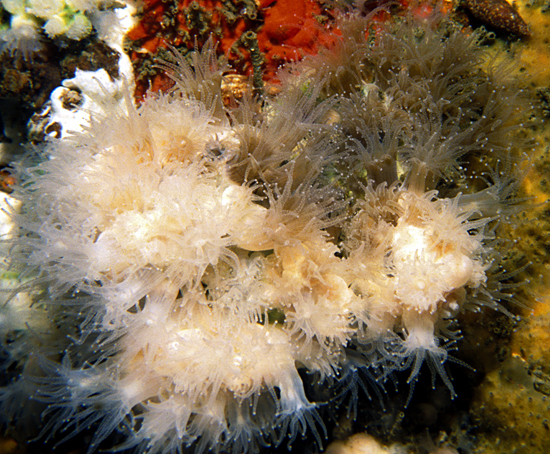 As the symbionts colonize the areas of new growth, the coral will turn brown (purple is a pigment produced by the host; brown/green is a pigment produced by the symbiont). For more information on host-symbiont coral relationships, check out the chapter in the Aquarium's Blue Impact multimedia tour called "color changing corals." Slowly, corals grow into vast underwater forests, like the Hydnophora coral forest below. 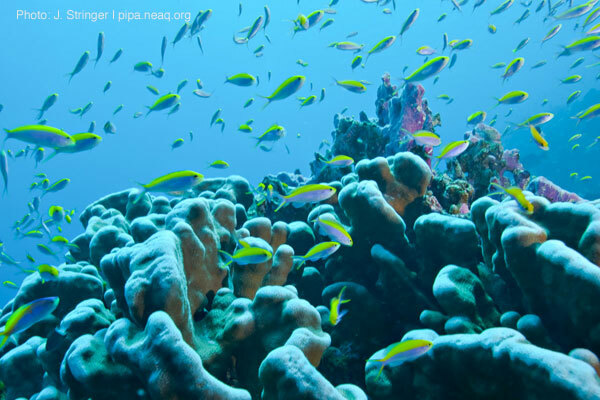 These forests provide shelter for many fishes and reef invertebrates. If these forests get destroyed, there is no Laroc (Lorax) to speak for them. Luckily in the case of the Phoenix Islands, the reefs are well on their way to recovery following the severe 2002 bleaching event. But that's not true everywhere, and corals need your help to stop the pollution, overfishing, disease, and myriad other stressors that threaten their very existence. 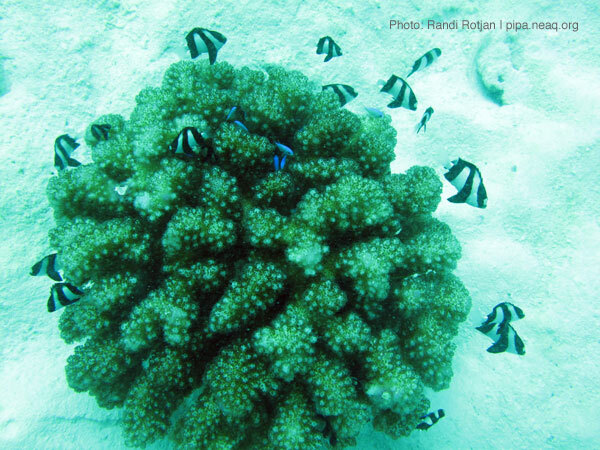 Amazingly enough, we don't need to go all the way to the Phoenix Islands to see corals. Now that we're home from the expedition, I'm once again thinking about my backyard coral reefs. Here's a glimpse of a coral species that grows right here in New England - the Great Northern Star Coral. It doesn't get as big as the tropical corals, and it doesn't create vast forests, but it is our local coral reef, and is certainly worthy of mention. :-) Plus, WHOI scientists are using it as a model system to examine the effects of climate change.